Chia seeds. You’ve bought them and more than likely used them in a smoothie or two, but what else have you tried? These little buggers are outrageously good for you. They are some of the fastest and most flexible foods you can find to add a little fiber and other nutrients to your meal – nutrients that you might not get otherwise. Omega-3 – chia seeds have more omega-3s than salmon! Protein– it’s a plant-based protein that’s easy to cook with and digest. Antioxidants– helps the body fight free radicals which can lead to cancer. Fiber– helps keep you regular. Calcium– chia seeds have more calcium than a glass of milk. Magnesium– helps with stress – magnesium is not found in tons of foods, and we can easily become deficient. 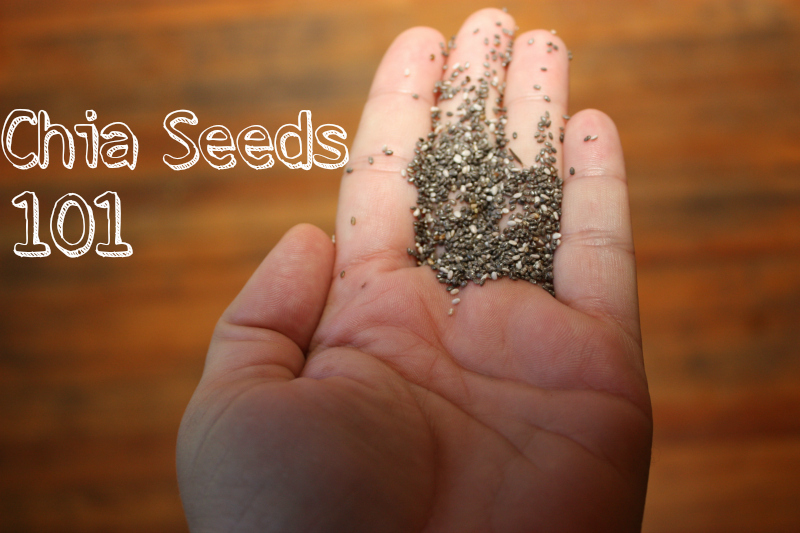 Potassium and tons of other minerals and nutrients are present in chia seeds. I think of chia seeds as my daily crime fighters, helping balance out the other food “crimes” I’m committing throughout my day. Crimes like mochas, whiskey and fried foods (not that I commit these crimes every day, but on a given day there’s likely to be a “crime” or two). They are considered a superfood because they have so much good stuff in them. Chia seeds contain 20% protein, 37.7% soluble fiber, 43% carbohydrates, and 31% fats, making the seed a better source of protein than any legumes, and a better source of dietary fiber than oats and other grains. Just one of the amazing things about chia seeds is that they can expand in liquid to 12 times their original size, which is why they have been used by many ancient cultures as a diet food. They expand in your stomach to make you feel more full. They are also used by athletes as a way to stay hydrated, because the seeds hold so much water in the stomach. Seriously, this is only the beginning of how good chia seeds are for you. For more info about the wonders of chia seeds, check out this link. You don’t need many chia seeds per day to keep you healthy. One ounce or two tablespoons of chia seeds per day is 42% of your daily fiber. It’s amazing, really. The easiest way to incorporate chia seeds into your foods is to throw them in a smoothie or throw some on top of what you are already eating, but you can cook with them too. Chia seeds are also a great travel food. Bring a bag of chia seeds and a can of coconut milk on your next vacay and you’ll have fixin’s for healthy, tasty chia pudding at all times! Here are a couple of fast and easy recipes that I like. 1. 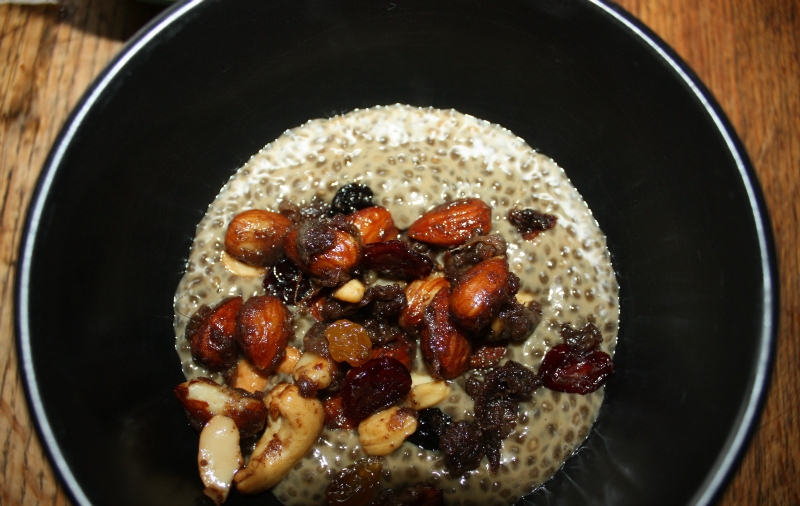 Cold Pudding- Here’s an easy, tasty recipe – Pumpkin Chia Pudding. The beauty of making this pudding is all you do is add some sort of milk to your seeds, plus some flavorings, and let them sit overnight or at least a few hours. 2. Energy Bars– You can make these chia seed energy bars to have around the house. They are way better than any granola bar you can buy in a store, because they have no added sugar (other than the dates), and they have all the nutrient benefits that chia seeds have to offer. 3. Hot Porridge– This one isn’t that different from the pudding idea, but I like to make a more savory, less sweet breakfast food, so I made up this recipe. It’s similar to the pudding – mix the night before with milk, let it sit overnight and then add other flavorings and heat it up. Even though this recipe says there is an 8 hour prep time, that time is spent in the fridge setting up. 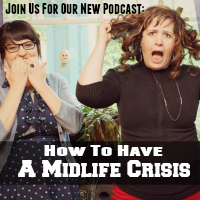 You don't have to do anything to it during this time. 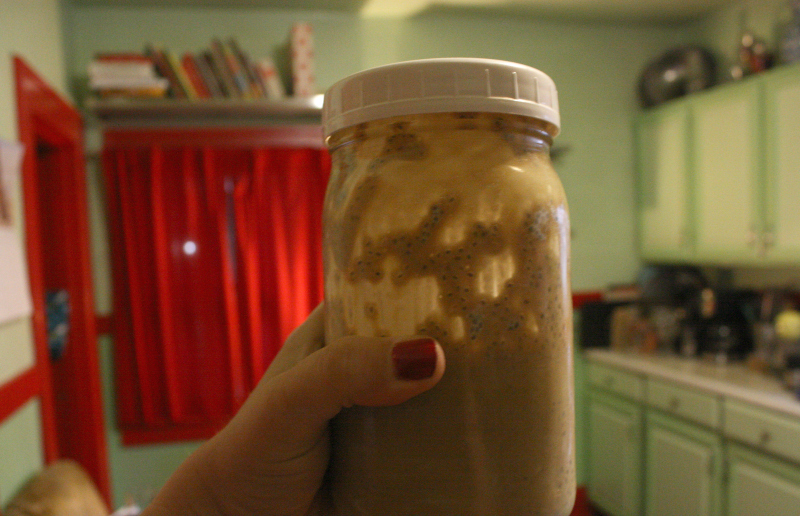 Mix coconut milk, molasses and chia seeds in a large mason jar, add lid and put in fridge overnight. The next day heat up chia concoction on the stove. In another pan add your add ins. Feel free to choose your own add ins or use these. Add butter to a pan, slice banana and fry in a pan for 3 minute on medium high. Add nuts and currants for about 1 minute. Then add spices: cardamom, cinnamon and nutmeg. Let banana, nuts and spices sit in pan for 5 minutes. Add banana, nuts and spices to the chia mix, then add vanilla. If you're feeling really fancy you can add other goodies too, like sesame seeds, pumpkin seeds, brown sugar, coconut flakes, other fruits, chocolate chips, etc. Sometimes I like to steam a little bit of coconut milk to add on top of the porridge. Enjoy! * I used molasses in the recipe because it’s a significant source of iron, calcium and potassium. Chia porridge hot, chia porridge cold, chia porridge in the pot nine days old. Well, actually, I can’t vouch for it after nine days, but hot or cold this tastes great!